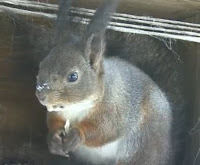 Russian Nature Video: Squirrel and a Jaybird! I think I can watch nature forever… Our online friend Evgeniy Shmukler (aka Nobody1313131313) likes to watch nature and make an interesting videos about it! This entry was posted in Nature on March 24, 2010 by admin. Боже, какое чудное и хорошо откормленное создание! 🙂 И снег… снег просто сказочный! My daughter and I love the Moscow Squirrel! Keep up the great filming!